Yay, a make up post! This evening me and the hubs went to the cinema to watch 'The rise of the planet of the apes' which was amazing btw. I whipped out my trusty Mac palette and immediately opted for 'Humid' eyeshadow, a striking green as it's one of my favourite colours. All Mac eyeshadows: 'Humid' all over the lid, 'Contrast' in the crease & outer corner, 'Vellum' on inner corners, and 'Brule' to highlight. Nars smudge proof e/s base + Urban Decay 24/7 pencil in 'Zero' on waterline and smudged onto upper lash line + Max Factor false lash effect fusion mascara. I LOVE the effect, it cheered me up and made a nice difference to some of the more 'boring' colours I wear. I love the green combined with the navy and the beautiful 'sheen' finish it gives off. I need to wear these colours more often! Do you wear green eyeshadow often? How do you make it work? I love the combo of green and navy, very unusual but it works! I'm a huge fan of green too, but find myself falling into the usual brown/taupe rut and have to push myself to be more colourful on the eyes. You look gorgeous, as always, best looking pregnant person I've seen! Not long now, you must be so excited. You look absolutely stunning babe! You can pull off these stunning bright colours so well and of course you are just glowing! @Natalie Ooow I love steamy too, I haven't worn that in ages! @Amynicola Thanks sweetie, I miss ur videos!! I don't wear green much. I tend to wear browns, blues, purples and greys when I do bold eyes because those colors are the ones that either emphasize the light brown in my eyes (purple, blue, brown mixed with copper) or grey (brown, grey, some blues). I haven't tried many greens! You look so pretty! I love that color on you! 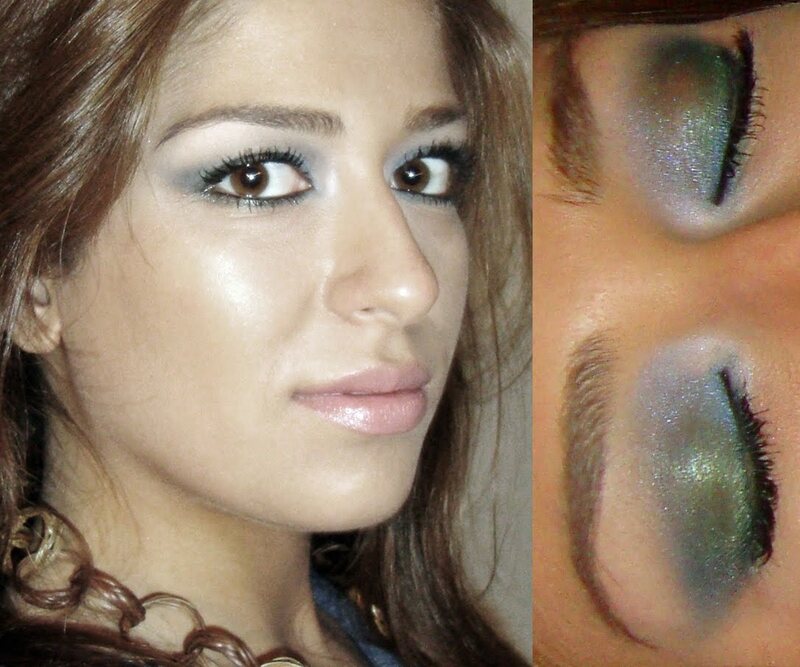 I love green eyeshadows! I usually pair it with browns, golds and taupey shades. =) LOVE! Aww you are still so little! When I wear green I try to wear a very khaki green, for some reason if it's too green it gives me that sleepy look...I love these colors on you! you look gorgeous! Love the green and blue combo. Looks stunning with your hair colour. I tend to always fall into the "play it safe" with neutrals but i love green with goldy tones too. you look beautiful!!! i have been loving green eyeshadow this summer!! i've been obsessed with mac humid, rock & republic envy, nars nouveau monde (green side) and the new sephora jumbo eyeliner pencil in kaki (it's a gorgeous olivey gold!) yay for greens! You look so beautiful! I do agree that sometimes you have to switch up the colors- and that green looks divine on you! U look so beautiful in that BnW pic! I generally prefer green on the trees but of late I've taken to green on my eyes too! =) loved the post! lovely! i wear green shadow a lot as i am green eyed and tend to like how it looks! I love Humid & Contast too! oh my gosh, gorgeous look & great photos! What a gorgeous colour on you! Gorgeous! 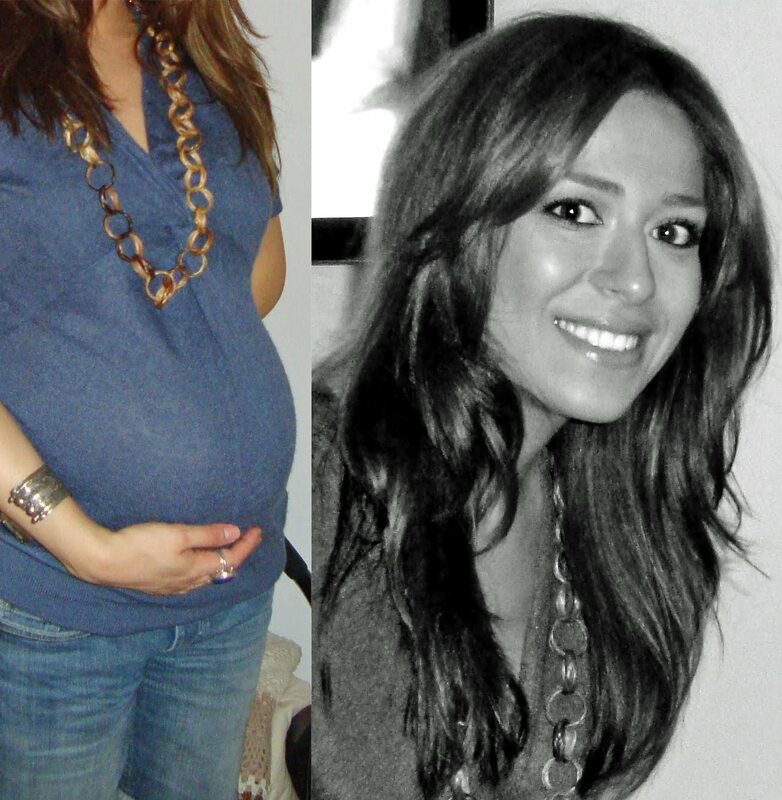 Your makeup looks flawless and your baby bump is adorable! I usually wear a darker green with flecks of gold. I'll be breaking that color out soon with the season change. All of my friends seem to be having babies - and we, too, hope to start our family soon! - but you are the most beautiful, most radiant pregnant woman I've ever seen. You look splendid. I was reading your blog came across yahnili makarna. Had to give it a try. It was delicious. Do check it out on my blog. You look beautiful - you definitely have the pregnancy 'glow' going on! ..you look stunning , I wish I looked like that while I was pregnant :)but I guess it's different for every women ..isn't the nesting feeling great ! I loved it ..
p.s could I ask where from is your chunky chain ? and congratz on being pregnant! You look absolutely amazing, your skin looks wonderful and flawless and the eye colour ideal. Perfecto lady! Wow I wish I glowed like that when I was pregnant! I was just mooching about in joggers looking rough. Your hair and make up look fabulous.